RS Components is making IoT sensing projects even easier to start, and more affordable, with the latest UrsaLeo Pi development kit. 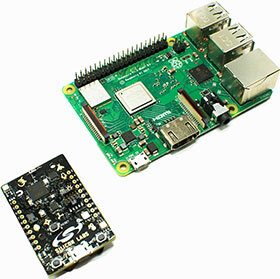 By combining the Silicon Labs Thunderboard 2 sensor module with a Raspberry Pi development board, UrsaLeo Pi delivers all the functionality of the UrsaLeo UltraLite development kit, at a lower price. Trading only reduced debug support and restrictions on hardware re-use, it is ideal for cost-conscious development in sectors such as Industry 4.0, automotive diagnostics, healthcare and general data monitoring. The Thunderboard 2 module contains temperature, humidity, UV, ambient light, barometric pressure, indoor air quality and gas sensors, a 6-axis inertial sensor, a digital microphone and a Hall sensor. The integrated Silicon Labs EFR32 Mighty Gecko multi-protocol 2,4 GHz radio supports Bluetooth Low Energy, Thread, ZigBee, or proprietary short-range protocols. Sample applications and APIs are provided to manage sensors, run diagnostics, and share information with enterprise software or business intelligence applications. UrsaLeo also provides a customisable dashboard and user-definable events to trigger alerts (texts, emails and actions). Up to 50 MB of data per month can be sent to the cloud platform free of charge, by a single user.